Lean on Pete - Available as a download or stream? 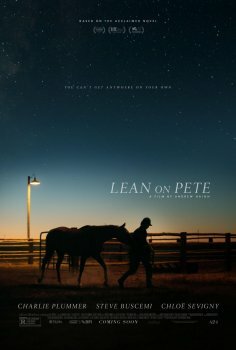 The fourth feature film from English director Andrew Haigh, “Lean on Pete”, is based on Willy Vlautin‘s novel of the same name. 18 year old Charlie Plummer stars as a homeless teenager with nothing to his name but an aging racehorse. He embarks on a thousand-mile journey from Oregon to Wyoming, in search of his only living relative, uncertain of whether they’re still alive and well. It is in his traveling where he experiences the brutal suffering life has to offer, as well as the unabashed kindness of complete strangers. The well-casted supporting roles are portrayed by Chloe Sevigny, Travis Fimmel, Steve Buscemi, Steve Zahn, Thomas Mann, and Amy Seimetz. This one can be seen in cinemas throughout the United Kingdom beginning in February, and one month later in the United States.